Valued by herbalists, midwives, and mothers throughout history, compresses and poultices are gentle yet highly effective natural remedies you can safely use at home. Easily made from materials you already have in your kitchen, such as ice cubes, herbs, cabbage leaves, lemon slices, clay, or beeswax, these simple preparations can quickly ease pain and inflammation, relieve congestion and edema, lower fever, drain abscesses, activate circulation, calm muscle spasms, and trigger the body’s natural self-healing abilities. 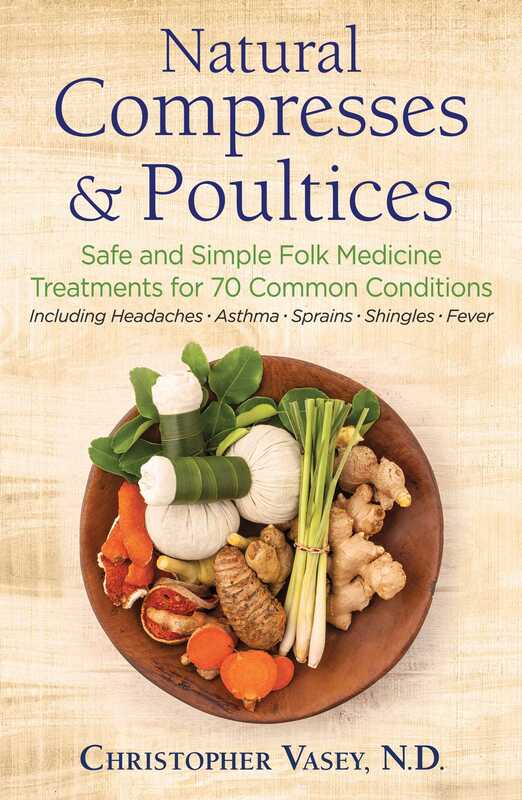 In this step-by-step naturopathic guide to compresses and poultices, Christopher Vasey, N.D., shows how to use these time-tested folk remedies to treat 70 common ailments and conditions, including headache, asthma, acne, sinusitis, earache, arthritis, sprains, hives, shingles, anxiety, insomnia, mastitis, constipation, diarrhea, muscle pains, bronchitis, and more. He explains that a compress is a cloth soaked in hot or cold infused water and applied to a specific part of the body. A poultice works similarly, but instead of a liquid extract, the healing material is made into a paste and applied directly to the body. He details what type of compress or poultice to use for each ailment, whether to use it hot or cold, where on the body to apply it, and for how long. Vasey also explores the physiological reasons these simple remedies can be so effective, such as how some treatments trigger healing through the nerves, others cause the skin to absorb or expel substances, and others have beneficial effects on the body’s internal chemistry. He reveals how compresses and poultices not only can alleviate acute symptoms, but are equally effective for dealing with chronic conditions. Offering an indispensable complement to your home first aid kit, this book provides you with a hands-on way to bring relief and healing to yourself and your loved ones. The purpose of this book is to make the use of compresses and poultices as accessible as possible. For each of the more than seventy health conditions covered in this book two or three of the most appropriate compresses and poultices are outlined, including a list of materials necessary to create them, the way to prepare them, and the way to apply them as well as instructions on the length of the application and how often they should be changed. Given the fact that the body is using eczema, a common skin ailment, as a means of ridding itself of the toxins congesting its tissues, the poultices used to treat it are those that support these efforts of elimination. Preparation: Take some nice cabbage leaves and remove the large veins with the knife so that the surfaces lie completely flat. Tenderize the leaves and make them flexible by crushing them with a rolling pin or large bottle in such a way they will adhere well to the skin. Application: Cover the skin requiring treatment with two or three layers of cabbage leaves. Make sure they are sticking securely to the surface of the skin and to each other by keeping them in place with the protective cloth. Preparation: Mix the necessary amount of clay with the cold water until it forms a moist yet firm paste. Application: Apply a 1-centimeter layer of the clay paste to the affected skin surface and cover it with the protective cloth. Preparation: Soak the compress cloth in the birch leaf tea. Wring it out slightly by squeezing it in the kitchen towel, the ends of which are twisted in opposite directions. Application: After verifying the compress temperature by placing it on the inner surface of the forearm, place it over the area needing treatment with the protective cloth and hot-water bottle on top of it. Once this is all in place, cover it with the wool blanket. There are a variety of compresses and poultices available to soothe the itching that accompanies certain skin disorders. The itching is due to the irritation caused by the presence of toxins in the skin. Preparation: Soak the folded cloth for the compress in the boiling water and squeeze it forcefully with the kitchen towel to drain excess water. Twist the ends of the towel in opposite directions to get the best results. Application: Verify that the temperature of the compress is not too high by placing it on the inside of your forearm, then place the compress over the irritated area. The hotter the compress, the more effective it will be. Duration: When the compress becomes cool, renew it by soaking it again in the hot water. Frequency: Repeat as many times as needed. Overexposure to the sun will burn the skin, making it red, sensitive, and painful. Compresses made from vinegar water and cottage cheese poultices refresh the skin and rapidly soothe inflammation and pain. When a person is suffering from sunburn, their skin temperature is higher than normal. Bringing the temperature down soothes the pains, especially as cold has anesthetizing properties. Preparation: Mix 1 cup vinegar and 1 cup cool water in the container. Soak the cloth in the mixture and lightly wring it out. Application: Place the cloth over the entire sunburned area. Duration: When the compress becomes hot, remove it and replace it with a cool one. Preparation: Spread the cottage cheese over the entire sunburned region. The thickness of the poultice should be 0.5 centimeter. Burns are treated differently depending on when they are treated. The immediate treatment consists of applying cold to the burn so that the skin loses the heat it has accumulated there as quickly as possible. At this stage, ice water compresses are indicated. Poultices and compresses are indicated only for superficial burns, not for second- and third-degree burns. Preparation: Place the ice cubes in the bowl of cold water. When the water is quite cold, soak the compress in it, then wring out some of the excess water. Application: Place the soaked compress over the skin. Duration: Before it becomes warm, resoak the compress in the freezing water and lay it back over the burn. Frequency: Repeat the applications as much as you like, until the pain ceases.